Will Power has written a highly acclaimed work with his Fetch Clay, Make Man. It deals with two very public Black men who have difficult roads to travel in their careers. Cassias Clay was a young fighter who the world remembers as Muhammad Ali. He embraced Islam in the days of the Vietnam War and that was a major event in many ways. Ali was so well known for the Rumble in the Jungle and the Thrilla in Manilla when he fought there, and he was one who never backed off from speaking his mind, albeit he was no Mensa member, he knew what he stood for and he stood strongly. He had declined to be drafted and the government, as well as many others, sought to punish him. After three years of litigation the Supreme Court voted 8-0 in his favor and his rights and titles were restored. If you were here in Atlanta in 1996, you saw him as the torch bearer for the Olympics. The play does not delve into this part of his life, per se. It is set in the years when he was fighting Sonny Liston and was married to Sonji. Sonji was not about to embrace Islam as Ali did, and accept the restraints the religion imposes upon women. That was one of the main problems which brought their union to an end. Sonji (Danielle Deadwyler) was the first of his 4 wives. Rob Demery plays Muhammad Ali, and his is fantastic. He’s got the body, the moves, the talent, and the fire within him to bring this champion to the stage. He’s accompanied by Brother Rashid (Amari Cheatom) who is a front man for the Nation of Islam and has his own agendum for how Ali should be perceived and what he should be saying. Enter Lincoln Perry a/k/a Stepin Fetchit. Stepin was one of the first well known Black actors. In fact he was the first to get full screen credits and first to become a millionaire, regardless that he wound up in bankruptcy in later years. Stepin (Brad Raymond) doesn’t share all the same priorities that Ali does; but they each know that they want equality and respect regardless that their journey to achieve it may travel separate roads. Brian Kurlander plays the only honkie in the show. He’s William Fox, of Fox Film Studio and the first to sign a Black actor to a contract that would prove to be quite profitable for all concerned. Stepin passed away in 1985, while Muhammad is still with us, although he suffers from Parkinson’s disease and has limited activities these days. Kenny Leon brought in actor and teacher Eric Little to direct this show; and with Eric as director and a first class cast of players, they present a very imposing production. Maybe some of the patrons under 40 won’t relate to the events of the 1970s as much as we AARP card holders. But, living here in the South with some understanding of what the Afro-American culture had to deal with even after the defeat at Gettysburg, and Rosa Parks’ bus ride and Malcolm X, it tells a story that is well worth listening to. It’s that scary time of the year when we all have to prepare for some ghastly events culminating on All Hallowed’s Eve. Agatha Christie didn’t necessarily connect this one to the pumpkin fest, but it is typical of her works, and just happens to occur at that time of the year. Letitia Blacklock (Nancy Powell) is hosting some nice folks at her home in Chipping Cleghorn. 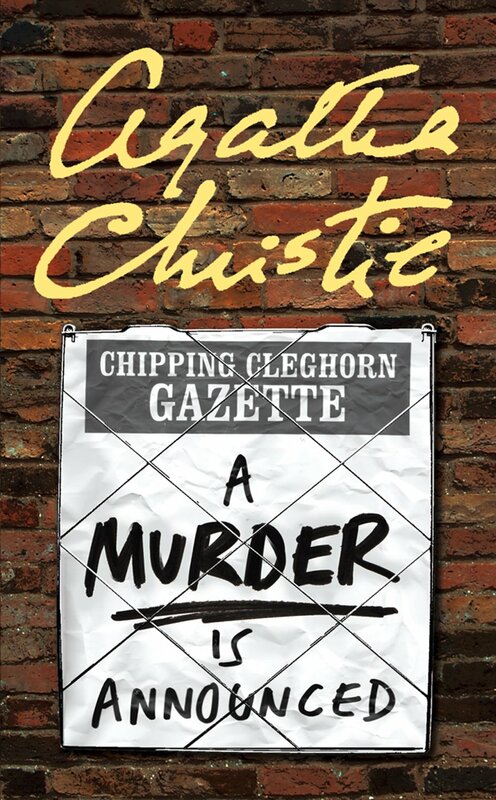 The local Gazette newspaper has run a weird classified ad saying, “A murder is announced and will take place on Friday, October 29th, at Little Paddocks, at 6:30 p.m. Friends accept this, the only intimation.” So what’s this all about? The maid, Mitzi (Abra Thurmond) is deeply concerned and figures somebody is coming to kill her. She’s been through a lot before she escaped from Hungary and has her own version of PTSD. Letitia’s BFF, Bunny (Bobbie Elzey) has some concerns as well as all the others, except for Patrick (Trey Harrison) who seems to be primarily concerned with tending bar. Miss Marple (Leslie Truman) come on scene and starts to think about what may be about to occur. But, nobody knows until the clock strikes, and then something else strikes out and somebody does wind up dead. But, who, and why, and how, and therein lies the play. Inspector Craddock (J. Michael Carroll) is called in to investigate and he isn’t a huge fan of having Miss Marple intervene. 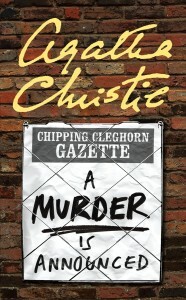 But, he may wind up with her help, as she is a central figure in so many of Agatha Christie’s works. At the intermission you will find many in the audience contemplating and discussing the possibilities of who may have been the killer. But, they’ll be wrong; and that’s what is so cool about this sort of a plot. It has red herrings galore and most folks may have more than one persona. Let’s skip to the bottom line. If you would like an evening of a Broadway Musical without the time and expense to travel to NYC, then go to AtlantaLyric.com and reserve your seats for this production which runs for only a couple of weeks. Directed by Brandt Blocker, the story comes from a comedy originated by Mel Brooks and Gene Wilder. And, in case you are one of the very few who have never seen the play nor the film, it is about a young doctor in NYC who is the sole surviving family member of the infamous Dr. Frankenstein of Transylvania. He was the one with that hunchback assistant, Igor (pronounced Eye-gore) who is such a scream. Pun intended. 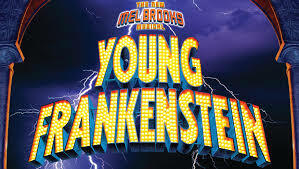 Googie Uterhardt is great as the young Frankenstein (pronounced Franken-steen) and Austin Tijerina plays Igor. When news of the death of the evil Frankenstein reaches NYC, Frederick Frankenstein has to take leave of his fiancé, Elizabeth (Mary Nye Bennett) and ship out for Transylvania. Igor meets him and escorts him to the Castle where Inga (Alison Brannon Wilhoit) awaits him. She knows not of Elizabeth, but is the local vamp who vows to win over Frederick. The deceased Frankenstein’s lover, or at least the one who loved him, is Frau Blucher (Marti Melle Lindstrom. There are a few problems. The townies are not inclined to accept Frederick. Alan Kilpatrick is the stiff type of Inspector Hans Kemp and he doubles as a blind hermit. And in Act II you will get to meet the green skinned big oaf of a monster played by Blake Burgess. But, this is a comedy, so everything comes out right and nobody gets killed onstage. OK. So maybe there are an abundance of sexually related double entendres. Not to worry, these won’t affect the younger folks. Everybody will get off on this totally first-class production. Great choreography by Ricardo Aponte and Jennifer Smiles, a great 15 member live orchestra directed by BJ Brown, top quality costumes, sets, props and projections; and a perfect view from every seat in the house. Seriously . . . . you can’t get better than this. Every cast member is right-on, the whole production just grabs you from the first minute, and you leave knowing that you have been privileged to be in the audience. The Lyric performs in the Anderson Theatre which is at the south 120 loop and Fairground St. Just south of Marietta Square. Easy to get to, even if you are coming from Gwinnett or any other area. Directions, tickets and more info available at their website mentioned above. If you snooze you lose. This one is too good to miss. The GSO is in the process of determining who shall become the new Music Director, to replace Michael Alexander who has moved on to enjoy the winters in Colorado. The board has narrowed the candidate list down to three first-class conductors, each of whom will be invited to perform here for audience response. On October 17, we were treated to a program, Sounds of Destiny, under the baton of Brian Dolinger. Mr. Dolinger currently conducts the Muscatine Symphony Orchestra and the Clinton Symphony. And, maybe he’d enjoy the winters down here as opposed to Iowa, where they really do get a little more snow than we do. The GSO opened with Giuseppe Verdi’s Overture to La Forze del desitno which sets the stage for thinking about what occurs and what might have occurred as we find that life is what happens while you wait for your plans to work out. The second number was Johannes Brahms’ Schicksalslied which is a choral piece and featured the GSO chorus directed by Bryan Black. It was based upon a poem by Friedrich Holderlin. 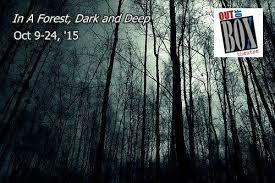 It’s one of those somewhat dark works, to be performed by a chorus with a chamber orchestra. Brahms is a fairly unique composer and you either dig him big time, or tolerate his work. But, after intermission the audience was treated to Beethoven’s Fifth which is one of those classical works that you want to hum along with, and even try to count the number of times that the principal dah-dah-dah-DAH chords get played, or woven into the score. Maestro Dolinger reminded me of the days when Yoel Levi conducted the ASO. For, Dolinger needed no score in front of him as he took to the podium. Every note and bit of instructional coding reposed in his head. The choral work was the only one where he may have looked at a score. He’s a very impressive conductor who interacts very well with an audience. Neil LaBute has written several plays, each of which seems to delve deeply into the human spirit, and often showing the errors of our ways. This work is certainly not a relaxing evening of the usual sibling interactions. 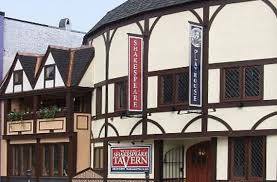 It is a two act play with two actors who engage one another at extraordinarily high energy levels, including the use of many expletives as the universal modifiers in just about every sentence which gets aimed from one to the other. John Stanier stepped up to the plate when a casting change had to occur and in eight days managed to learn every single line of more than two hours playing time. He is Bobby, the brother who gets called upon to help out his sister when she needs to get a lot of stuff removed from a little cabin in the woods. The cabin had been a trysting venue, and she is the Dean of her college and has some secrets she needs to obscure from view. Aretta Baumgartner is the sister, Betty, and in the small town where they live, she has a reputation on the street akin to that of Blanche in The Golden Girls. Something drastic has occurred, and it isn’t fully laid out in Act 1. For Betty tends to mask facts as she goes along the path of life. On the other hand, Bobby tends to be crude and hard nosed about a lot of things, especially dealing with normal standards of morality and ethics. With a good set by Joel Coady and under the direction of Kara Cantrell, these two actors do a first rate job with a story that may not share the same appreciation. It is not for the kiddies, nor for the Church Ladies; and it is one of those that having seen it once, you’ve seen it. 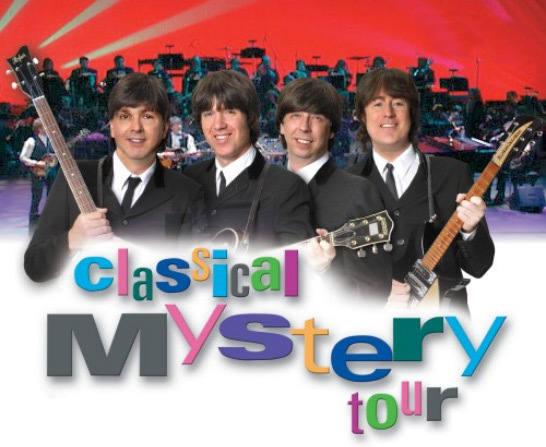 The ASO Pops orchestra under the baton of Michael Krajewski paired up with the Classical Mystery Tour group at Symphony Hall to present a delightful evening of music of The Beatles. The Classical Mystery Tour features Jim Owen (John Lennon) on rhythm guitar, piano, and vocals; Tony Kishman (Paul McCartney) on bass guitar, piano, and vocals; David John (George Harrison) on lead guitar and vocals; and Chris Camilleri (Ringo Starr) on drums and vocals. What is truly unique about the concert is that by having the quartet backed up by a full orchestra, you get to hear many of the tunes as they were done in the recording studios, because The Beatles didn’t tour with scores of musicians. The ASO Pops orchestra did do a couple of numbers without the quartet, but they all played through another couple of dozen numbers. It was so difficult for many in the hall to resist singing along when numbers such as Penny Lane or A Hard Day’s Night were being done. Thankfully, the touring group did engage the house and invite us all to join in some numbers. The funniest was when they said that those under 30 should sing a line, and we suspected that they both did. This group which started in 1996, has been well received in many countries and works hard on tour. From here they travel down to Florida and then out to Kansas City, and on and on. Could be called a Long and Winding Road. 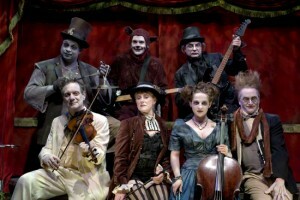 The Ghastly Dreadfuls, created by Jon Ludwig and Jason Hines, returned to the Center for Puppetry Arts in time for All Hallows Eve and a jolly good time for all. This one is for the more-or-less adults among us, and they say you should be old enough to buy booze if you wish to attend. The Dreadfuls are made up by Scott DePoy, Kristin Haverty, Jason Hines, Jon Ludwig, T.T. Mahoney, Spencer G. Stephens and Reay Kaplan. With 5 of them providing the music live on stage, and each of them handling roles in 15 skits featuring great puppetry, classic costumes, high stepping dancing, and wanna-sing-along musical numbers. You may think that puppets are just for kids; and while the youngsters do enjoy visiting this Atlanta theatre and museum; this is one that is playing to full houses of adults and every one of them in the audience leaves having had a really enjoyable break from the news of the day. So, don’t be afraid to try something different and maybe a bit eerie. When selecting seats, the better views are from rows C or higher, as some action takes place over the puppet set. You can read more and see times and tickets at puppet.org and buy online or by phone. It’s always a treat when you can return to a museum that you’ve visited before, only to find new and intriguing exhibitions. We’re fortunate in our town that we have some hard working and creative staffs who are dedicated to luring us back to them. 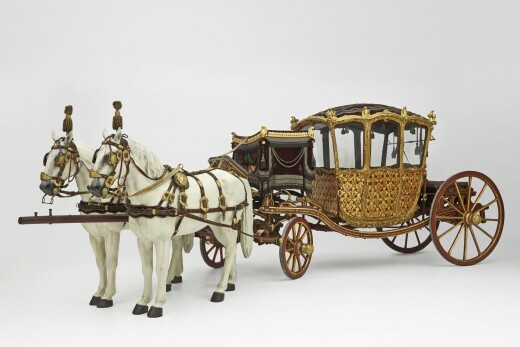 HAPSBURG SPLENDOR, an exhibit of masterpieces from Vienna’s Imperial collections is opening in a couple of days, featuring almost a hundred objects from the Hapsburg dynasty. These kings collected a lot of interesting works, including paintings by many old world masters such as Titian and Caravaggio, as well as loads of objects of art such as ivory and gold tableware. The ladies of The Court indulged themselves with lavish costumes, and not to be ignored the gents wore plenty of fancy attire when not parading in armored suits. You’ll love the royal carriage which is displayed. While the carriage is real, the horses pulling it have dried out a bit. This exhibit, was brought together by a collaboration with the Minneapolis Institute of the Arts, the Houston Museum of the Arts and the Kunsthistorisches Museum of Vienna. And you can make a total Museum Day for your family if you add in the current exhibits and the IMAX at the Fernbank Museum, which is a quick drive down Ponce from mid-town. In addition to the dinosaurs who await you, you will enjoy two special exhibits. Searching for the Queen of Sheba which has interesting relics from various venues and religions; and adjoining this exhibit hall is a photographic exhibition, Women of Vision, dealing with the works of women who shot for the National Geographic magazine. They were among the first to break some glass barriers and pursue their dreams. The IMAX theatre is currently showing two films. Robots obviously is as the title suggests, while Wonders of the Arctic will take you on an excursion that you could not imagine, and probably would not elect to sign on for. But it is a very compelling cinematic presentation. Arthur Miller’s play, The Crucible, dates from the early 1950’s, and was alleged to be based on his contempt for the McCarthy hearings. In fact, Miller was summoned to appear before the House Un-American Activities Committee in 1956 and found guilty of Contempt of Congress when he refused to name others who had attended some meetings with him. I recall when his play was staged at Wellesley College around that time, and there were some who took offense at such a terrible thing. Interesting, as McCarthyism is now seen as an idiotic attempt at mind control over the masses, employing outrageous allegations. Many in show business were black listed after such hearings. And the proof of the matter is that The Crucible has become a revered standard (no pun intended). Back in the 1690’s they did not have any radio ro TV in Salem, Massachusetts. So, maybe burning witches at the stake may have been entertaining. For those of us from the area recall the history that the Puritans left England to become free of religious controls, so that they could inflict their own versions of the same. And they were freaked out by the idea that the Devil might contract with humans to be his workforce for the evil that men, and women, could do. Jeff Watkins directed this extraordinarily energetic performance which runs almost 3 hours. It is a four act show, but done with but one intermission. Eighteen players engage the audience with a very convoluted tale. It’s hard to recall who was whom among the townsfolk; but you will certainly find the Reverend Parris (Drew Reeves) to be an egotistic preacher interested only in his own career. And Troy Willis plays the miserable Deputy Governor holding Court over trials of more than 40 men and women alleged to be witches and subject to being hung if found guilty. The story involves girls and women who had a girls night out in the nearby woods, and their dancing brought on allegations of witchcraft. Then we have people lying as to who was there, who did what, and so much more. Underneath all this tapestry there is an issue of infidelity of John Proctor (Matt Nitchie) who got it on with somebody not his spouse. One must realize that in these days, what we now think of as everyday behavior of any politician, may have sent a man or woman to jail or the gallows. They had little or no sense of humor, nor of human behavior. In fact, farmer Proctor could have saved his life after he owned up to his own misdeed, but he refused to incriminate any other person. Ergo, he got to swing badly. The play is intense, with lots of yelling and some terrific fight scenes. Not for kiddies. But certainly for those who understand the relationship twixt politics and power. Now and forever. It is a significant example of the theory that great minds may think alike, and this collaborative partnership between the Aurora Theatre and the Horizon Theatre, permits each to produce a first-class comedy by Christopher Durang. It brings to mind the works of Chekhov. Especially the three sisters and the cherry orchard. When this show opened on Broadway it won the Tony for Best Play in 2013, and it’s a non-stop riot. Set in a small town, you meet a brother and sister who live alone in the family home. Grumpy old geezer, Vanya, is played by William S. Murphey. He’s a little difficult at times. Just ask his sister, Sonia (Lala Cochran), but not while she’s having coffee in the morning. They’re half-siblings who seem to live in different worlds most of the time. The maid is Cassandra (Denise Arribas) who is also a psychic and purveyor of doom when it suits her to be so. And she’s very effective in what she does; albeit culinary arts are not her best talent. Their sister, Masha (Tess Malis Kincaid) comes for a brief visit. Masha is an actress who has followed her passion, made some money, and helped out financially, if not psychologically or physically. Now that the parents have passed on, she wants to reassess her relationship and she knows who is most important to her. She’s thinking about selling off the family home and moving on in life. She shows up for the weekend with her boy toy, Spike (Edward McCreary) who provides the eye candy for many in the audience. Spike may not necessarily share Masha’s attachment; and he’s also a few years younger than her. The other bit of discourse is the neighbor girl, Nina (India Sada Tyree) who wants to follow her dreams to act. But, Masha may not be the best advisor in that regard. All hell breaks loose when five of them get invited to a party that night and Masha wants to control the type of costume that each may use. After all, she has to be center stage.